Ever finish a job on your car, only to look over and see a couple of fasteners that you left out? You can avoid this amateurism by buying or making a box with compartments and labeling the compartments as you go. 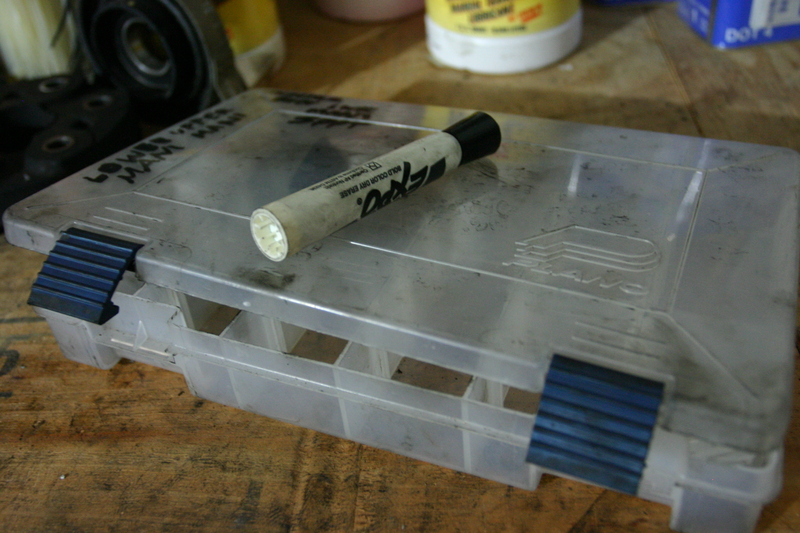 A fishing tackle box and a dry erase marker is what I use. I fill the box up from left to right, and label the compartments on the see-through lid. When it is time to put the fasteners back in, I just work backwards in sequential order. This minimizes the chance of forgetting a step or leaving out fasteners. Organization makes everything go smoother, and the more complicated the job, the more important organization becomes. I used to be intimidated by the bigger jobs like removing a head, but as I became more organized and methodical, I realized that it wasn’t any harder than changing the oil or replacing the spark plugs. The steps weren’t any more difficult – there were just more of them that you had to keep straight. If you get in the habit of staying organized, it will help give you the confidence you need to conquer bigger and more complex jobs. Plus, you won’t have the situation where you’re cleaning up after a night of wrenching in the garage and look over to see some fasteners that you left out.